This CellML model has been checked in both COR and OpenCell. Currently it can be opened in COR but due to the presence of 'circular arguments' the model does not run. However the model will run in OpenCell but although it does run, it does so very, very slowly, and so far we have only been able to get it to solve for 3 iterations. The units have been checked and they are consistent. Abstract: This paper describes a computational approach to modeling the complex mechanical properties of muscles and tendons under physiological conditions of recruitment and kinematics. It is embodied as a software package for use with Matlab™ and Simulink that allows the creation of realistic musculotendon elements for use in motor control simulations. The software employs graphic user interfaces (GUI) and dynamic data exchange (DDE) to facilitate building custom muscle model blocks and linking them to kinetic analyses of complete musculoskeletal systems. It is scalable in complexity and accuracy. The model is based on recently published data on muscle and tendon properties measured in feline slow- and fast-twitch muscle, and incorporates a novel approach to simulating recruitment and frequency modulation of different fiber-types in mixed muscles. This software is distributed freely over the Internet at http://ami.usc.edu/mddf/virtualmuscle. 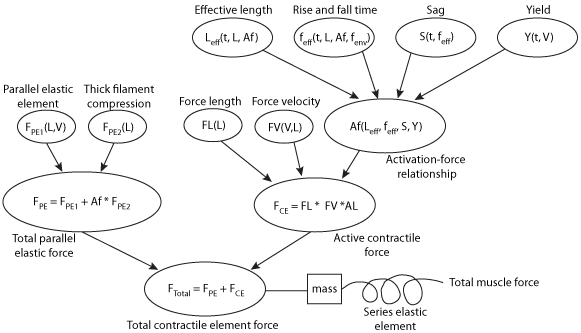 Schematic representation of the model equations and terms. These elements were designed to have a one-to-one correspondence with the physiological substrates of muscle contraction. The behavior of each element is governed by an equation driven by one to four input variables, with one to seven user-modifiable coefficients. The coefficients can be modified in the BuildFiberTypes function. Complete descriptions of these elements can be found in Brown and Loeb, 2000 and Brown. FPE1 represents the passive visco-elastic properties of stretching a muscle. FPE2 represents the passive resistance to compression of the thick filaments at short muscle lengths. FL represents the tetanic, isometric force–length relationship. FV represents the tetanic force–velocity (FV) relationship. Af represents the isometric, activation–frequency (Af) relationship. feff represents the time lag between changes in firing frequency and internal activation (i.e. rise and fall times). Leff represents the time lag between changes in length and the effect of length on the Af relationship. S represents the effects of ‘sag’ on the activation during a constant stimulus frequency. Y represents the effects of yielding (on activation) following movement during sub-maximal activation. Derived from workspace Cheng, Brown, Loeb, 2000 at changeset 793a1c2df2bf.